"Do Visual Artists Need To See?" My principal interest is the exploration of a sense of place. I aim to evoke a response to the experience of being there, rather than to make topographic references, so that the work is essentially about a place, rather than of it. I am fascinated not only by the ever-changing image of moving water, but by the point where it hits the land – liquid meeting solid, soft meeting hard. Another theme I endlessly explore is trees – often not in full leaf, but showing the bare branches of winter with their beautiful fractal geometry. My painting process can be deceptively lengthy and can involve many layers; some are clearly revealed, some glimpsed, some hidden. The pulling and pushing, adding and subtracting is integral to the visual history of each piece. I aim to maintain energy and freshness, and sometimes a degree of ambiguity. I always work in series, allowing one piece to inform another which in turn redirects me to the first, as I look for the appropriate ‘chord clusters’ of colour. Eventually, I feel that the series has run its course, like the turning of the tide. The practice of working with wax and collage developed when I had extremely low vision and felt a need to include a tactile element into my working practice. (Somehow it never occurred to me that hot wax might not be the most practical medium in the circumstances!) I continue to use the technique since a life-changing eye operation and find it lends itself well to abstraction. Charcoal drawings are an important part of my practice, sometimes leading to oil paintings of the same subject, sometimes not. I find that the medium lends itself well to the freedom of action and I enjoy the challenge of achieving depth purely through tonal variation without the use of colour. 1986-2006 Development Director/Consultant to Sadler's Wells, Rio Tinto, Spanish Arts Festival etc. As well as exhibiting at galleries, Joanna Brendon holds an Open Studio twice a year. In the Summer, this is as part of Artists at Home, which she co-ordinated from 2000-2010. http://www.artistsathome.net. She also hosts an open studio before Christmas. Her regular fellow exhibitors are Bobbie Kociejowski (woven textiles) and Annette O'Sullivan (jewellery). Joanna's main body of work is landscape-based, but she has also produced a series of conceptual prints, exploring the theme of vision, as a means of confronting her own visual impairment. Three pieces from this series are in the permanent print collection at the V&A Museum and six works were displayed in the Saatchi Gallery in 2010. A series of 10 prints are now on permenant display at Moorfields Eye Hospital. In 2007, Joanna was Artist in Residence at Brantwood, John Ruskin's home in Cumbria. This proved a fruitful period and led to a solo exhibition there the following year. In October 2011, she had a solo exhibition at the Holywell Music Rooms in Oxford, being the featured visual artist to mark the 10th Anniversary of the Oxford Lieder Festival. Prior to her commitment as a full-time painter, Joanna Brendon was the first director of the concert hall, St John's Smith Square. 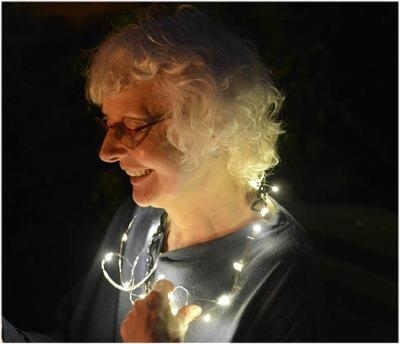 As well as concerts, she has presented poetry readings and exhibitions and has been deeply involved in fund-raising for the arts and other charitable causes. She is a committed member of the Development Board of Interact Stroke Support - Reading for Recovery http://www.interactreading.org . With the artist Jocelyn Clarke, she has run workshops for visually imapired visitors to The Wallace Collection and she has been involved with NRAS (National Rheumatoid Arthritis Society) since developing an aggressive form of the disease herself.